Glasgow's Matt Fagerson will make his debut. SCOTLAND COACH GREGOR Townsend made 12 changes to his starting line-up for this weekend’s Test against the US Eagles in Houston, with fullback Stuart Hogg captaining a team which includes two sets of brothers. Having demolished Canada in Edmonton last weekend in the opening game of their summer tour, Scotland have rung the changes for Saturday’s game at the BBVA Compass Stadium in Texas. The two debutants are Glasgow Warriors duo Matt Fagerson, who comes in at number eight and scrum-half George Horne. Both players will make their first international appearances alongside elder brothers Zander and Pete. 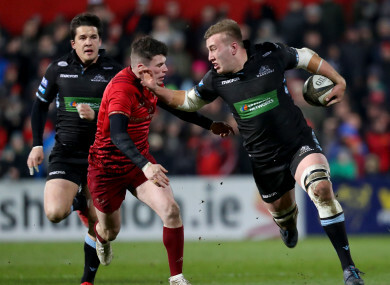 Lock Ben Toolis, wing Blair Kinghorn and Sale Sharks wing Byron McGuigan are the only three players to retain their places from the side which defeated Canada last weekend. “We always planned to play as much of the squad as possible on this tour, and we also deliberately picked more Edinburgh players in the first game because their season finished earlier,” Townsend said. “The USA have won their last six games and scored a lot of points in the process. They’ve beaten two teams that have already qualified for the Rugby World Cup – Uruguay and Russia – and put 60 points on both of them. The Fagerson and Horne brothers are the 48th and 49th set of siblings to play for Scotland, and the 22nd and 23rd pair of brothers to play in the same Test match. It is only the eighth time in nearly 700 Scotland Tests that two sets of brothers have been on the field at the same time, joining the Evans and Lamont brothers (2010), Bulloch and Leslie brothers (2001), Milne and Hastings brothers (1990), and the Neilson and Orr brothers, who did so four times (1891-1892). After Saturday’s Test in Houston, Scotland will wind up their summer tour against Argentina on 23 June. Email “Brothers in arms as Townsend rings the changes for Scotland's clash with USA ”. Feedback on “Brothers in arms as Townsend rings the changes for Scotland's clash with USA ”.